Our spacious well-appointed themed honeymoon suites truly set us apart from other hotels in Bensalem, Pennsylvania. We feature 40 suites that all include a king bed and a number of features to make your stay both comfortable and enjoyable. An assortment of suites are available to help cater to the intention of your vacation whether you are newlyweds, looking for a romantic getaway, or simply a rejuvenating break from the daily grind; we have the perfect suite for you. Aside from the intrinsic amenities like our proximity to Philadelphia and the soothing cottage garden setting of our Bensalem, PA hotel we offer a number of hotel features and services to make your stay completely restful and enjoyable. Our spacious suites feature a number of convenient touches to help make your stay worry-free and our gracious amenities take your vacation from ordinary to extraordinary. 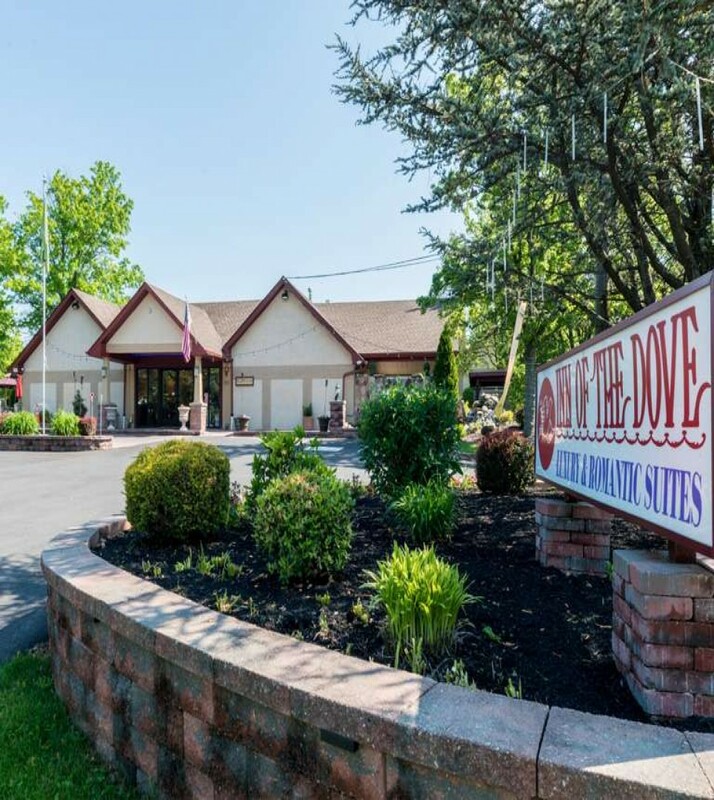 Whether you're looking for a honeymoon suite, business accommodations, or a simple quiet getaway close to Philadelphia, make Inn of the Dove Luxury Suites your top choice. Please call Front Desk @ 215-638-3683 Ext 1 for more customized Time. We have a 7 Day Cancellation Policy. If you wish to cancel or modify a reservation, you must do so by 4 PM 7 days prior to your arrival date. If you cancel or modify post the expiration of the Cancellation Period or you fail to show up, a no-show charge will be levied on your credit card for one full night. A $75 Deposit is Required at the time of Booking, You pay remaining balance when you check in, Without deposit, you reservation will get cancelled. For Cancellation of Reservation 7 days advance notice is required. No show will get charged Full one night. Black Out Dates like New Year & Valentine 50% Deposit Required . *Deposit is based on 1 night reservation...if more then 1 night booked deposit may vary on amount charged. Aside from the intrinsic amenities like our proximity to Philadelphia and the soothing cottage garden setting of our Bensalem, PA hotel, we offer a number of hotel features and services to make your stay completely restful and enjoyable. Our spacious suites feature a number of convenient touches to help make your stay worry-free and our gracious amenities take your vacation from ordinary to extraordinary. Complimentary parking for cars, trucks, RVs, and buses is available for our registered guests. Complimentary wireless internet is available throughout the hotel for our guests. Children under the age of 12 stay free in existing bedding. Unfortunately there is no capacity for an extra rollaway bed in our rooms. ADA defined pets are welcome to our hotel. Sorry, No other pets are allowed.